1. Put the bulgar in a large bowl with a pinch of salt. Pour over 200ml just-boiled water, cover the bowl with cling fi lm and set aside for 20 minutes. Fluff up with a fork, then stir through the salad onions, tomatoes, cucumber and herbs. 2. In a small bowl, whisk together 2 tbsp oil, the lemon zest and juice, tomato purée, honey and chilli fl akes; toss with the salad and season to taste. 3 . the remaining ½ tbsp oil in a large frying pan or griddle pan over a medium-high heat. Slice the halloumi into 8 pieces and then fry for 1-2 minutes on each side. 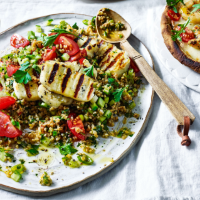 Divide the salad between plates and top with the halloumi.